I guess we are all very familiar with using dice in all kind of environments. Many teachers have their favourite dice games and they can observe their pupils enjoying the game whilst reinforcing some of their basic numeracy skills. The pace is obviously governed by each contribution that comes along and the conversation may be more fruitful if you don't start with a predetermined outcome. There are lots of responses and prompts you can make that will be appropriate throughout quite a short session. As the talk continues pupils become more confident to add their own thoughts, and the beginnings of number recognition, counting and addition may well occur. One way of extending the use of dice to help pupils develop their thinking further is to bring in some of the less usual dice – those with a different range of numbers on them. Just showing some 0 to 9 dice in place of the usual 1 to 6 dice can give the opportunity for you to ask some good open questions. "What's different about this dice ?" "Could we play that game again with this one?" Another die that can act as a catalyst to thinking is one with faces numbered 1,2,3,1,2,3, in place of 1-6. Try it out - you may be surprised. Use sticky labels to cover up the 4,5,6, or if you have them, make your own from a blank cube*. Remember also that there are dice with varying numbers of faces giving rise to some quite large numbers. I once had a die the size of a billiard ball that had 100 faces! Another way of getting into the larger numbers is by having two 0 – 9 dice of different colours so that one will determine the tens numeral and the other the units. Returning to the 1-6 dotty dice there are useful activities that can be used to develop of spatial awareness. Imagine having dice placed in a corner and seeing what totals the dots make. It's not too difficult to count the dots as long as long as the starting point is remembered, something which seems to develop slowly with some pupils. So, in the example above we have 14 dots visible. Giving the challenge of finding the lowest/highest numbers possible, or asking if the same totals could be achieved with different faces showing, for example, can lead to a longer investigation. Some pupils could just use one die to start with whilst others could go straight into using three or even more. At NRICH we have a lots of number of activities that use dice. We try very hard to have activities that have a Low Threshold and a High Ceiling, so that pupils of lower ability can get into the activity and get somewhere, whereas the most able can easily be extended through the activity. You can read more about this here. Looking at the numbers (whether dots or numerals) on the faces of the dice can be explored in the activity Taking a Die for a Walk. This does however require some good fine motor skills unless you have one of those lovely very large foam dice measuring about 20 cm! Sometimes we have pupils who do seem to be very slow at the numbers side of mathematics but who seem to be coping much better with the spatial. So moving from Taking a Die for a Walk to the interactivity Roll the Dice could be a good challenge. If this is tried then how about extending it to find all the routes possible? 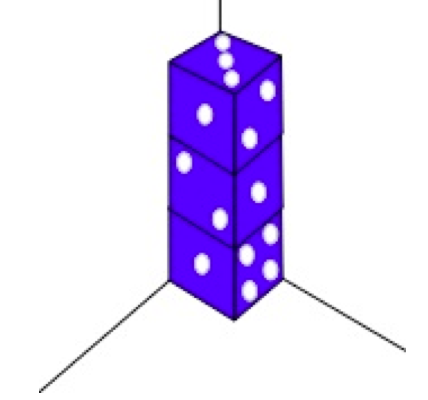 Before finishing, the most common use of dice in schools apart from games is exploring probability. A simple introduction to this can be found in A Bit of a Dicey Problem and the game Tricky Track. Finally, many of these activities support children in developing their recording skills and gradually becoming more proficient at working systematically, both very worthwhile mathematical skills. I do hope you and your children explore some of these dice activities - get hold of as many different ones as possible: there are dice within dice, spherical dice and even weighted dice! Some children will benefit from a large foam die that has transparent pockets on each face, for you to insert whatever is appropriate. Whichever you use, enjoy!